What Are The Best Prenatal Vitamins To Take? If you want to give your baby the best head start in life, good nutrition during pregnancy is essential. While you can’t beat getting vitamins and minerals from fresh foods, supplements can be useful to keep nutrition levels topped up. However, with so many different pregnancy vitamins available, how can you tell which ones you should be taking? Here, you’ll discover everything you need to know about prenatal vitamins and the best ones you can take to keep you and baby healthy. What’s The Difference Between Multivitamins And Prenatal Vitamins? Many women stock up on multivitamins once they discover they’re pregnant. It’s logical to think they’re your best option due to the sheer number of vitamins and minerals they contain. However, did you know they may not contain the right level of nutrients to keep you and baby 100% healthy? While they will provide some health benefits, it’s actually better to opt for prenatal vitamins instead. The main reason being, multivitamins are designed to keep you healthy. They don’t accommodate for the needs of a growing baby. Prenatal vitamins on the other hand contain enough nutrients to support you and baby. It’s important not to take both multivitamins and prenatal vitamins together. This is because doing so would potentially result in an overdose. While the effects may not be as severe as an overdose on pain medication, it could still lead to serious health problems. So, if you are planning on taking additional vitamin supplements, it’s best to stick to prenatal, rather than multivitamin supplements. Do You Actually Need Prenatal Vitamins? So, now we’ve established prenatal vitamins are the better option, the question is do you absolutely need them? The answer is no, technically prenatal vitamins aren’t considered essential, however they can have great benefits for you and baby. There have been studies carried out to determine how essential prenatal vitamins can be over the years. However, these were largely carried out in developing countries. This means the women were already likely to have some form of nutrient deficiency, so prenatal vitamins would have proven more beneficial. In countries such as the US, such deficiencies are rare, but that isn’t to say prenatal vitamins aren’t beneficial. To sum up, prenatal vitamins aren’t considered essential, but they can help to ensure you and baby are as healthy as possible throughout the pregnancy. Out of the above, Folic Acid is by far the most essential. It’s actually known to prevent birth defects, specifically neural tube defects which are known to affect the spinal cord and the brain. They tend to occur within 28 days of the pregnancy which is often before many women even realize they are pregnant. Therefore, experts do recommend those looking to get pregnant start taking folic acid supplements before conception has even occurred. The minimum recommendation is 400 micrograms, but some experts suggest aiming for an increased 800 micrograms instead. Calcium is equally important as it helps to prevent bone density loss. When you’re pregnant, your baby needs calcium in order for their bones to develop healthily. This means they absorb some of your calcium. If you’re not getting enough calcium to support the additional demand, you could therefore start to lose bone density, putting you at an increased risk of conditions such as Osteoporosis. The majority of prenatal vitamins contain between 200-300 milligrams of calcium, and you’ll still need to ensure you’re getting plenty in your daily diet. Iron is another nutrient to look out for. It’s responsible for helping the blood to carry oxygen throughout the body. Both you and baby need iron for this function so it’s important to keep your levels topped up. It’s said you’ll need around 27 milligrams of iron each day; something most prenatal vitamins provide. Iodine is something you probably don’t know much about. In pregnancy, Iodine is especially important to ensure your thyroids are functioning correctly. If you have insufficient Iodine levels, it can cause some pretty serious issues for baby, including significant mental disability, deafness and stunted growth. It also has the potential to cause a miscarriage and increases the likelihood of stillbirth. So, you’ll definitely want to opt for prenatal vitamins which contain approximately 150 micrograms of Iodine. Vitamin D actually works alongside calcium to ensure your baby’s teeth and bones properly develop. It also helps with the skin and your baby’s eyesight. 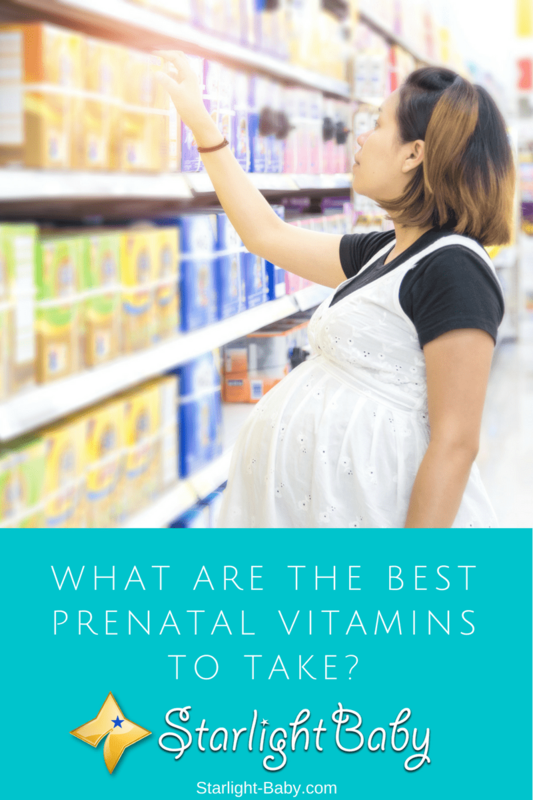 This is one of the key vitamins you should look out for when buying prenatal vitamins as it’s one of the few which isn’t easy to get through diet alone. As most of our Vitamin D comes from direct sunlight, it’s even more important to choose Vitamin D enhanced supplements if you’re pregnant during the winter months. The majority of prenatal vitamins contain around 400 international Vitamin D units. Finally, DHA helps to support baby’s healthy brain development. It’s an essential omega-3 fatty acid and is usually found in oily fish – something you’re advised to stop eating during pregnancy due to the high mercury content it contains. So, to make up for the potential deficiency, prenatal supplements containing around 800 milligrams of DHA are recommended. These are the top nutrients you’ll want to focus on when choosing the best prenatal vitamins. With so many different brands available, it can be difficult knowing which ones are the best to take. That’s why it does help to have some knowledge of the top nutrients to look out for, as well as the amount you should be getting. Click here to shop for prenatal vitamins on Amazon! Before taking any prenatal vitamins, it’s a good idea to talk to your doctor or pediatrician. They will be able to advise you on which would be most suitable for you and also inform you of anything you need to be wary of. Overall, prenatal vitamins are good to take and can ensure you have a healthy pregnancy. You just need to know what to look out for and be aware of the nutrients you’re already getting from your daily diet. Can A Calcium Or Vitamin D Deficiency Cause Problems With Tooth Eruption? This is a very good advice to consider for all pregnant women. Honestly, when my wife was pregnant with our first baby her doctor prescribed these vitamins but the problem is my wife didn’t take all those vitamins because she believed those will make her chubby. She just maintained to drink her maternity milk for our baby inside her. But now I know that she and our baby needs all these nutrients to become healthy. Now, we are planning to have our second baby and I will make sure that this time she will take all the vitamins her doctor will advise for not to worry of anything especially folic acid. I will make sure that both of them are healthy until our baby is born. Better to make everything taken care of than to deal with lifetime medication. I totally agree with you. It is always best to take all the prescribed vitamins while the baby is still in the womb so he/she can fully benefit from the nutrients while developing. I have this tried and tested because I also didn’t take all my vitamins when I was pregnant with my third child as compared to my other kids. My third child is sickly while my other kids are more ‘resistant’ to sickness. That’s what I’m afraid of. I don’t want our baby to get sickly all the time. Hopefully we can still catch up with the vitamins that we should have given to him. Anyway we always seek advice from his doctor for us to come up with vitamins for him to get healthy all the time. Thank you Elsa for the heads up I appreciate it. It’s interesting to read the needs of pregnant mothers to take prenatal vitamins and how essential they are to the development of the baby at the early stage of life. I could recall being diagnosed with low calcium in my body back then while I was little and I wonder if such could have happened if mom had taken enough prenatal vitamins s while she was carrying me. Sorry to hear about that. It probably is possible but I dont know since am not a Nutrition expert. I agree that its a good post on the usefulness of nutritional vitamins during pregnancy and after child birth. Thank you for the sympathy. It’s now in the past and all I’m grateful for is that I’m still alive and glad to be a member of this blog. Joining has taught me so much about pregnancy, pregnant moms and babies in general. Your mom’s lack of vitamin intake when she was pregnant with you may be one factor. An associate clinical professor in Obstetrics and Gynecology said that a pregnant woman will not be able to draw sufficient nutrient from a healthy diet alone, so yes, vitamins are essential. I can somehow relate to you Henry. I remember my mother told me that she didn’t take any vitamins and even milk when she was pregnant with me. I also remember she told me that I don’t have any vaccine injected to me and I just thought that I wouldn’t have been sickly on grade school years. But good thing I was able to overcome all those and this time I will make sure that our second baby will not suffer the same fate. I could attest to your being sickly when you were young @joey because of your mom not taking any prenatal vitamins and milk. I had the same mistake with my third child; not that I didn’t take vitamins or drank milk because I did, however, I didn’t do it on a regular basis. There were days I didn’t take them so my third child is also sickly even now that he is already a teenager. He is often absent from school and I really regret this mistake. This is good piece of advice and recommendation for not only pregnant women, but am their spouses to be wary of for when the time comes. I’ve never heard of parental vitamin, this is the first. And drawing from your conclusion I think its a good choice for those in such situation. It’s definitely wise to take vitamins/supplements when pregnant. It would benefit the baby when he/she grows up. Giving the baby all the nutrients it could have while still in the womb would have countless benefits. I know of this because I experienced it with my five kids. I have one child who is a bit prone to sickness because I didn’t take all the possible vitamins when I was pregnant with him, as compared to his siblings. It’s great to differentiate between multivitamins and prenatal vitamins as this plays a vital role in the well-being of a pregnant mother and that of her baby. Most pregnant women take lots of multivitamins during pregnancy, whereas that cannot take the place of prenatal vitamins. A major difference to note between multivitamins and prenatal vitamins is the fact that the prenatal vitamins simply contain those nutrients derived from fresh fruits, vegetables and natural diets which multivitamins do not contain. You’re right about multivitamins not being able to provide all the nutrients required by a mom and her baby. Prenatal vitamins should be the vitamins of choice because they provide nutrients that are beneficial not only to the mom but to the baby as well. Prenatal vitamins should not be taken for granted. When I took my pregnant wife to the doctor for the first time, she prescribed calcium, folic acid, and iron. Is it necessary to take these prenatal vitamins, I asked the doctor. What if we take foods rich in iron, calcium and folic acids? The doctor said the food you take will fulfill your vitamin requirements, however, it will not be sufficient for the baby. The baby needs more. We did not want to take risks, therefore, the wife began taking the supplements prescribed by the doctor. sadly, these supplements have side effects, which is very natural. For the record if I’m being honest, I don’t really know some of these vitamins are called prenatal vitamins. Most times, I see all of them as multivitamins which are good for pregnant mothers as well. But getting to read more often them, knowing the differences as well as the similarities with them, I’m really pleased to discover that. Thanks so much for sharing this incredible piece of information.